G&S shots of weaving and farming. I love farming and fishing. When I was a kid, my father took me fishing all the time. My stepmother kept our backyard filled with plants, and taught me the importance of keeping a garden. I love both of these so much, I’m more likely now to play video games that feature these two activities. 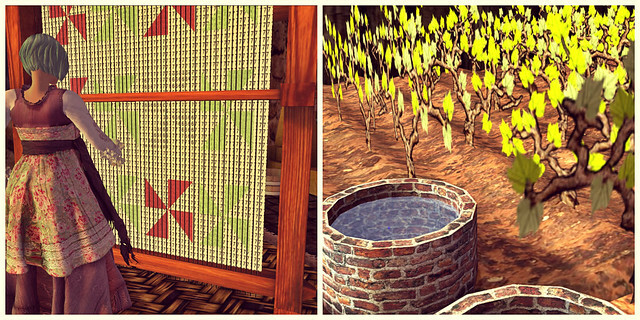 Imagine my joy when I discovered both the Life2 and G&S systems in Second Life. Although clearly meant for different time periods, both systems feature cooking, gardening, and eating to keep your energy up. Life2 is more for the modern period, geared towards city sims with families. G&S is created with Gorean and medieval sims in mind, expanded to include mining, crafting, carpentry, fishing, and raising animals. For the player who wants to invest and bring more entertainment to their SL experience, the task of figuring out which system is best for them can be daunting. Which one should you pick? Thankfully, I’ve shelled out the cash on both of these so you don’t have to–read on to check out my comparison of both. Top row: Life2. Bottom row: G&S. Neither Life2 nor G&S include combat. They are both geared towards promoting a deeper experience for roleplay and alternative currency. With both, you can sell items for HUD cash (not Lindens), OR you can sell your items for Lindens instead. With enough time, you could possibly earn back what you initially spent to get the HUD and its necessary accessories. HUD Comparison: Life2, left. G&S, right. Life2’s initial HUD cost is 495L. I spent about 2000L on the Life2 system to purchase not only its HUD, but additional scripts to turn the furniture I already owned into useable objects (meaning, to keep my hygiene, sleep, bladder, and entertainment scores up, much like The Sims). G&S’s HUD is 0L but, its accessories to do anything are not free, ranging from 150L to much higher. With G&S, the focus isn’t on furniture but what you farm with. I spent about 700L on a vineyard set, a fishing rod, and a tobacco set in order to begin harvesting various items. There’s only one bar to keep replentished on your HUD, and that’s energy. You can keep it up by drinking or eating various foods you cook or buy. Saving Money: if you don’t want to spend much money on either system, purchase the Life2 hud and use the bathrooms in the mainstore, OR purchase the G&S hud, and then find a farming co-op like this one where harvesting and equipment use is free. The cooking system for Life2 and G&S are pretty much the same. Strengths: G&S has secret recipes you must study at a predesignated desk model to unlock. 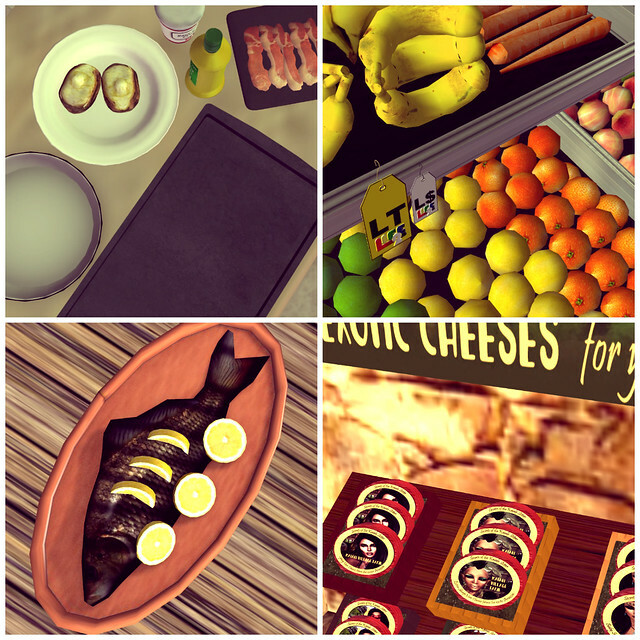 Life2’s food system is more flexible, allowing various creators to submit sales items to Life2 devs for approval–which would drive more traffic to your store. G&S lets users harvest not only food, but create beer and wine, and custom-stamp their barrels and bottles for running their own line of alcoholic drinks. Drawbacks: G&S’s farming system is aesthetically less pleasing than Life2’s. Whereas Life2’s plants are beautiful mesh models, G&S relies on textures and flat panels, which doesn’t always look great when the alphas are clipping in a field. 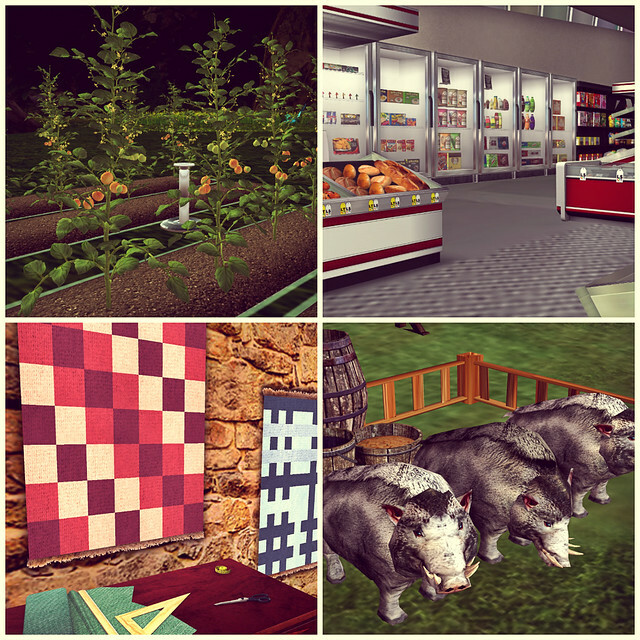 …And Extra: Farming, breeding, and fishing are features G&S has. Life2 doesn’t allow you to raise animals which you can then butcher for meat. G&S’s fishing system is also more engaging than the popular 7Seas system, letting you cook not only fish, but larger catches such as salmon and tuna in various ways. You can also find different goodies, such as scraps of metal, beer, tobacco, and other items by casting your reel. Did I mention G&S has velociraptor mounts? Yeah, they have that too. I’ll be honest. Looking up Life2 on Second Life search, I didn’t see too many users participating in reselling items. Both systems are pretty old, but because G&S is linked to Gorean and medieval sims, it has a larger backing and is easier for rp’ers to get into. Life2 does have the potential to match G&S’s player base, but they limit themselves by focusing on a modern aesthetic. However, I could say the same for G&S. Its system is perfect for users who want the Harvest Moon experience. The devs need to update their sculpt products, get away from using alphas for plant textures, and look into more universal furniture for users to place in either medieval or modern homes. If they did, they could overcome other systems and dominate the market. If your desired SL experience is more family-oriented and modern, get Life2. But if you want more minigames, crafting, and a more robust secondary market, invest in G&S. I still have garden sets from both systems in my home, but I can easily see myself transitioning to G&S items over time. I hope this guide will be helpful to other users! Do you enjoy Life2 or G&S? Do you cook with a different system altogether? Let me know about it, and I’ll investigate it. Thanks and see you next time with more goodies to check out! They totally are, and they make the grid more fun! I’m always hunting down fishing tournaments now, I love them!